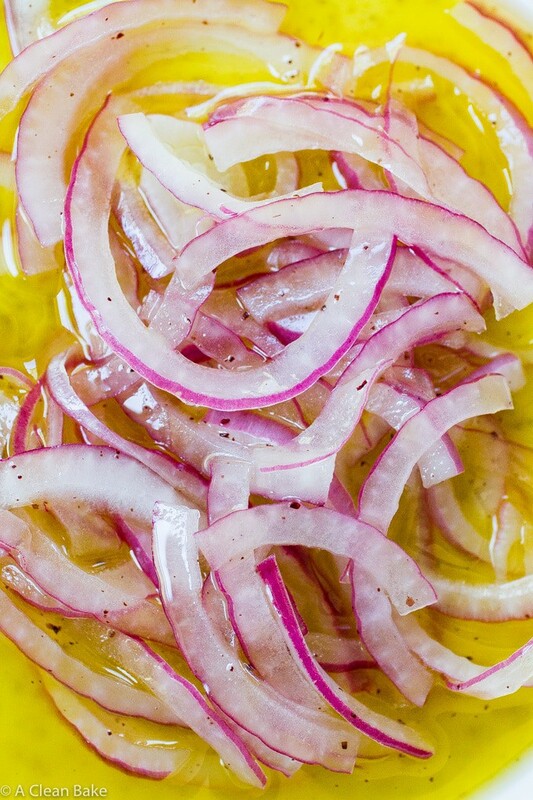 Easy Marinated Onions with sumac will be your secret weapon for elevating any dish. Try them on salads, sandwiches, burgers and more! 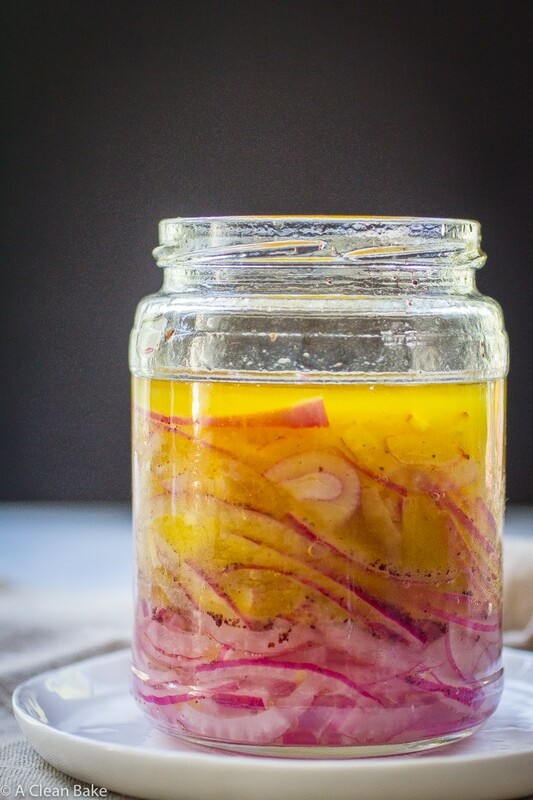 While, on the surface, a post called “easy marinated onions” may seem like filler content for a week when I have run out of ideas, let me be the first to assure you that this isn’t a phoned in recipe. In fact, this may be the recipe that elevates your summer to The Summer of Awesome Meals. Prepare your meal. Add these easy marinated onions. Meal Immediately Becomes Awesome. Here: let’s run an experiment. What are you having tonight? Burgers? Top with marinated onions. A sandwich? 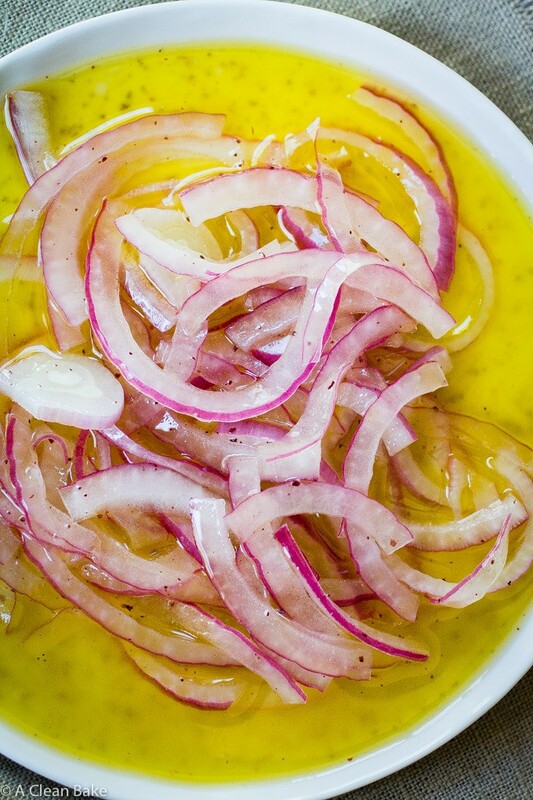 Layer on marinated onions. Salads? Oh, this is too easy. Tacos? Eggs? You get the gist. 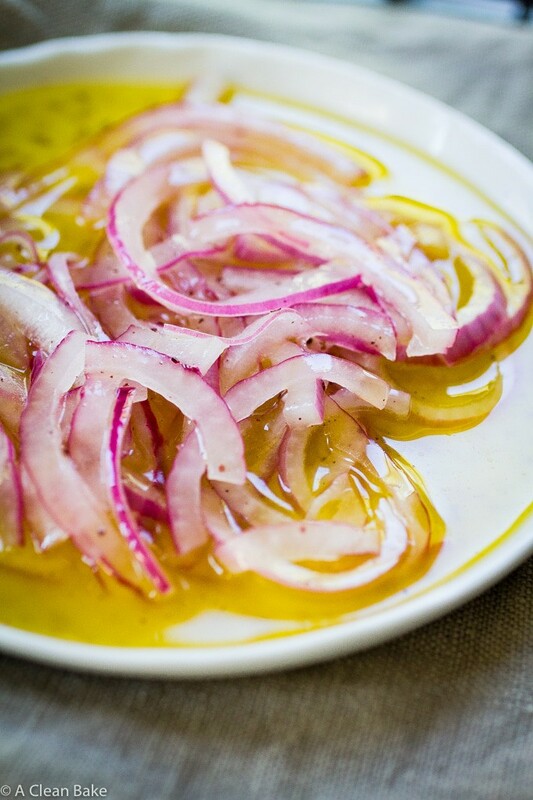 Even soup – no kidding – tastes wonderful with these marinated onions. Despite it being 90 degrees outside, we had the quickest cream of tomato soup (our go-to meal around here) for dinner on Sunday night, and garnished it with – surprise, surprise – marinated onions. Ask me why I’m a maniac about these random, overly simple food. Go ahead. Onions are a tricky ingredient. While, on the one hand, they impart essential flavor and are also, incidentally, an excellent prebiotic food (meaning they feed the probiotics, or good bacteria, in your gut that are so essential to good health and digestion), they are, on the other, really, really stank-ay, tainting your breath for far longer than seems reasonable. Not cute. Also, if you have IBS or an otherwise finicky digestive system, they can be irritating. Since you’re smart enough to take it from here, I’ll leave you with the recipe so that you can get to marinating and start topping everrrrrything with these onions! Add the sliced onion to a medium jar or airtight container. Add the rest of the ingredients to the container. Seal and shake vigorously for 10 seconds. Taste, adjust ingredients to your preference. Reseal the jar and allow to marinate at least 10 minutes, and up to 48 hours. 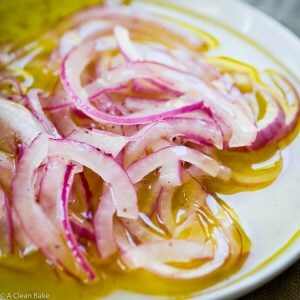 One you finish the onions, you can add more sliced raw white or red onions to the marinade and reuse it once or twice! Note: This recipe was part of a chicken kebab dish I made for Simple Mills. Check it out here!